“Though Narendra was born with many divine qualities, his Guru Shriramakrishna’s teachings moulded him properly to perform his duty towards the world in future”, said Swami Madhavananda on 16/09/2016. 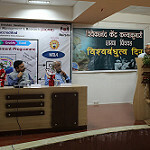 He was delivering first lecture on ‘Narendranath te Vivekananda – Ek Divya Pravas’ of two day lecture series organized by Nagpur Branch of Vivekananda Kendra at Madhav Sabhagriha, Nagpur. The subject of second lecture was ‘Sw. 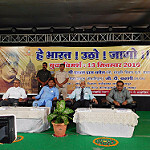 Vivekananda – Alaukik vyaktimatva ani Advitya Prabodhan. 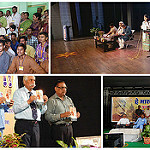 600 people attended the programme. 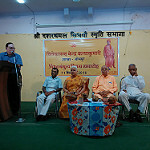 Kendra’s Vidarbha Vibhag Pamukh Anandji Bagadia welcomed Swami Madhavananda. Nilimatai Ketkar introduced the dignitaries to the audience. The programme started with Eikya Mantra from Vedas chanted by Pallavi Gadgil. 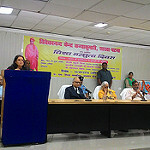 A song on Swami Vivekananda was presented by Sarthata Deshpande, Vaidehi Pathak and team. Vipin Vaidya and Madhur Bagadia presented the inspiring quotations of Swami Vivekananda. 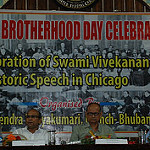 Sunandatai Pande spoke about the significance of Swami Vivekananda’s lecture at Chicago in1893. Lakheshwar Chandravanshi explained the activities of the Kendra. Dr. Hedawoo, Nagar Sanchalak, delivered the vote of thanks. Dr. Madhuri Wagh conducted the proceedings. Vidyarambha ceremony of VKV Sissiborgaon was held on 07/09/2016. Total Eighteen students along with their parents were present in the function. Vidyarambha ceremony was performed by Girija Didi of VKV Dhemaji and she was accompanied by Dona Bora who is is selected as the first teacher of VKV Sissiborgaon. After that programme a public meeting was held and it was presided over by Smt. Lavanya Hajarika, the principal of Sissiborgaon Higher Secondary School. Sus Reboti didi, Jt. Secretary, VKSPV, Guwahati , addressed the parents and others regarding the purpose and role of VKVs in the society. Sri R N Pathak, Office Incharge of VKSPV, Guwahati also told regarding the importance of support of parents and well wishers in the growth of the vidyalaya. Sri Mridupavan Chutia, Associate Professor of Sissiborgaon College (Secretary, Prastutui Samiti, VKV Sissiborgaon) introduced the dignitories present in the meeting and also delivered the vote of thanks. Almost 100 people were present in the meeting. Nam Kirtan was also performed by the Vhakats of the village. students of VKV Dhemaji presented patriotic songs and Bhajans on the occasion. On behalf of Universal Brotherhood Day Celebration Vivekananda Kendra, Mysore conducted a programme having various activities like cultural competitions, inspirational talks, pictorial exhibition etc. From 15 schools 126 students participated and expressed their talents through these cultural competitions. The competitions went well on the day and the First day session had been successful as a part of universal brotherhood day. Later on 11th sept 2016 on Sunday as to our plan we made a minor attempt in propagate swamiji’s life and his message to younger generation by showing a short film of Swami Vivekananda to samskara varga students in JSS Hostel in Mysore. Later the day we had our chief guest Smt. Nagaratnamma didi a senior Vivekananda Kendra karyakarta, and Sri C.V Gopinath Ji Retd. Additional Secretary to govt of India, Who had been the main speaker of the day. Sri Gopinathji presented a power point presentation on topic “ MERA BHARATH MAHAN”- Pride and achievements of India in history in innumerable fields, and greatness of India to the students in an interesting and well detailed prideful way. 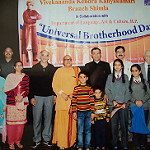 A beautiful and detailed history of India and Swami Vivekananda was presented behind the students which made all to feel proud of themselves of being Indians, and inspired their spirits. Conclusively it had been an effective step towards inspiring young blood of India at this tender age. The concluding programme was on 12th sept 2016 which had the prize distribution to the winners of the competition held on 10th sept 2016. We had our chief guest “Sri Ramesh Ji” a teacher at Ramakrishna Vidyashala, Mysore. Even, he was a well versed and resourceful person who even guided students in spiritual, educational way towards their bright future. Vivekananda Kendra Dibrugarh organized an inter schools Surya Namaskar Competition and a mass Surya Namaskar program held at Vivekananda Kendra Vidyalaya ,Dibrugarh on the occasion of “UNIVERSAL BROTHERHOOD DAY” to commemorate the Historical speech by the patriotic Hindu monk of India Swami Vivekananda at “World Parliament of Religion” held at Chicago,America on 11th September 1893. 350 attained the program. 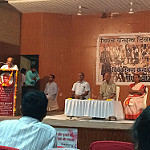 Dr. Narayan Upaddhyaya,(Retd. Principal of Assam Medical College and founder professor as well as head of the department of Neurology of Assam Medical College) was present as an Appointed speaker during the event. The program started at 7 am with lightening the lamp by Dr. Narayan Upaddhyaya and mangalacharan by Sanskar Vrga Children. Sri Ravindranat Sadveykar , Principal of VKV Dibrugarh delivered the welcome speech. 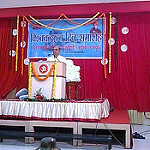 Dr. Kunjalata Deori, Nagar Sanchalika was also shared the dais among the distinguished guests. 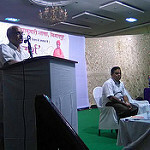 The keynote address was delivered by the Appointed speaker Dr. Narayan Upaddhyaya. Inaugural session was concluded with Shanti Mantra. Almost all the attendants of the event participated in the Samuhik Surya Namaskar. 2nd Prize: BNP High School. Green Rameshwaram” is an initiative of Vivekananda Kendra under its Natural Resources Development Project (NARDEP) activities. As a catalytic agent, Vivekananda Kendra has brought the stakeholders together through networking to join hands in this transformation. It reinforces the belief that true development happens only when it is holistic and sustainable. Rameshwaram is a unique island that has a special place in the hearts of Indians. It contains within its shores history, mythology, spirituality, religion, archeology, natural beauty, bio-diversity. It attracts tourists and pilgrims in equal numbers. To preserve its wonderful gifts of nature, Rameshwaram needs to go green. It needs intelligent landscaping, green transport, a solid waste-disposal system, an underground drainage and sewage network, rain-water harvesting pits and livelihood opportunities for locals through sale of special merchandise. Rameshwaram needs to combine eco-tourism with religious tourism to preserve its place on the tourist map of India. Any developmental activity in Rameshwaram should focus on preserving its historical and archaeological monuments and conserve its ocean bio-diversity spots even as provisions are made for tourist influx. While active involvement of the local stakeholders is crucial to the greening of Rameshwaram, tourists too must be made participants in its preservation. This can happen only through education. Rameshwaram needs multi-media centres to showcase its cultural, anthropological, natural heritage. A visit to Rameshwaram must be an experience, not just a trip. This newsletter is an attempt to showcase the initiatives happened in the month of August 2016 in different verticals for updation and seeks your involvement and participation like the Squirrel did to enable Lord Rama to build the bridge to Sri Lanka. Bhubaneswar, 11.09.2016: Celebrating Universal Brotherhood Day to commemorate the epic speech delivered by Swami Vivekananda, on 11th September 1983 at Chicago in The World Parliament of Religions, city wing of Vivekananda Kendra KanyaKumari organised a special ceremony in Bhubaneswar on Sunday (11th Sept.). CHSE Chairman Basudev Chattoi graced the occasion as Chief Guest and impressed upon the relevance and usefulness of Swamiji’s speech and values in the present day context. Quoting from the famous Chicago speech of Swami Vivekananda he highlighted the need for universal brotherhood to maintain peace and all round development of human race irrespective of their religion. He said that the man on this earth has continued too long to be fanatic about insisting that his religion alone was true and other religions being false had no right to exist. Nagar Sanchalak of Vivekananda Kendra KanyaKumari Bhubaneswar branch and former Director NIT Rourkela Prof. G K Roy in his welcome address elongated on the objectives of celebrating Universal Brotherhood Day and involving the youth in various nation building activities. Dr. Ashok Panda, GM – Sanmarg and visiting faculty at Ravenshaw University also graced the occasion as Guest of Honour. 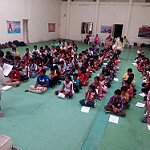 Sri Anil Kumar Kar, Vani Vibhag Pramukh (Coastal Odisha region), Vivekananda Kendra Kanyakumari presented a brief introduction on Vivekananda Kendra Kanyakumari and its various activities in Odisha and across the country. Nagar Pramukh of the city branch of Vivekananda Kendra Kanyakumari Santap Kumar Jena presented the vote of thanks on the occasion. Winners of various school, college and university level competitions organised by Vivekananda Kendra Kanyakumari in Bhubaneswar in the first week of September were felicitated with prizes and citations on this occasion. A Group yoga competition was held on 3rd September by the Kendra wherein 13 schools of the city participated. The 1st prize winners performed a group yoga sequence during the function. The winners of the interschool completion on Odia and English recitation of the epic speech of Swami Vivekananda held on 4th September were also felicitated on this occasion. Students from 21 different schools in the city participated in this completion. Similarly, the winners of ‘Uttishthita Jagrata Swadhyaya’ examination on the book containing messages of Swami Vivekananda on SELF development, held at various colleges and departments of Utkal University were felicitated on this occasion. A total of 368 students of colleges and university participated in ‘Swadhyaya’ competitions. A documentary film on Mananeeya Eknathji, the founder of Vivekananda Kendra KanyaKumari, was also screened on this occasion. 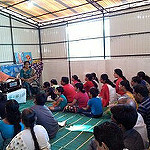 190 wellwishers and children attended the programme. On the occasion of Samskruta Diwas interschool and college Subhashita and Sanskrit Patriotc song competition organised on 7th August at Kendra. On 21st August Sanskritotsava celebrated . Sri Venkataramana HEGDE was Chief guest and Smt Nagaratnammaji presided the programm. Su. 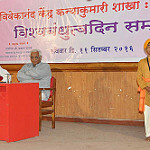 Soumya Didi gave talk on Sanskrit. Sanjeevini Dhyana taken by Smt. Nagaratnammji. At the end prizes distributed to the winners of competition. Two days health camp was organized on 20th and 21stAugust 2016 at Majuli by Vivekananda Kendra NRL Hospital, Numaligarh in association with Vivekananda Kendra Vidyalaya, Majuli. The Medical team comprised of Dr Diganta Konwar, Dr Dwijendra Milli, Dr Dharmakanta Hira, Mrs Jaya Sarkar, Mrs Padmaja Khound, Mrs Kalpana Pio Rongpi, Shri Hiranya Baruah, and helpers Shri Dipankar Chetia, Shri Durlov Thengal & Shri Kishore Bori. We started from hospital at 6:00 am in two vehicles along with the medicines for Nemati ghat and crossed Brahmaputra by the 8:30 am ferry service. We had the camp at Pahumara Village on the first day where around 400 patients attended and at Bhakat Chapori on the second day where the attendance was around 200 patients and would have been more had we not ended the camp at 12:20 pm as we had to pack up an return (had to leave the vehicles on one bank of a stream and transfer the team including the medicines to the other bank and then again move further on to the camp site which) to catch the ferry at 3:00 pm. 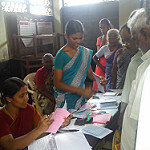 Free medicines were provided to the patients after consultation. 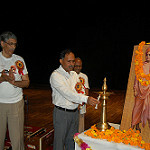 The programme was co-ordinated by Shri Basudev Upadhyaya, Principal VKV and his team of teachers and parents. Two doctors from Majuli government hospital also joined the health camp on the first day for 2 hours on request of Principal VKV. I also accompanied the medical team to Majuli. The Free Eye Camp scheduled for 22nd Aug to mark the birth Anniversary of Padmashree Dr Robin Banerjee was successfully organised yesterday. It was jointly organised by Padmashree Dr Robin BanerjeeTrust and Lions Eye Hospital Jorhat. The Camp was formally inaugurated by Sri Prakhyat Duwarahji, chairman, VMC VKV Golaghat. 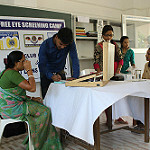 A total of 73 patients got their eyes checked. Out of those, 21 were from VKV Golaghat including 8 students. The students' parents were later on conveyed the suggestions/treatments prescribed by the doctor. Out of the general public, three (03) patients required operation and were taken by the Lions Eye Hospital group yesterday itself for free operation.